From My Brown Eyed View : Hate letter sent to family of an autistic child: But the real disabled person is the sender! 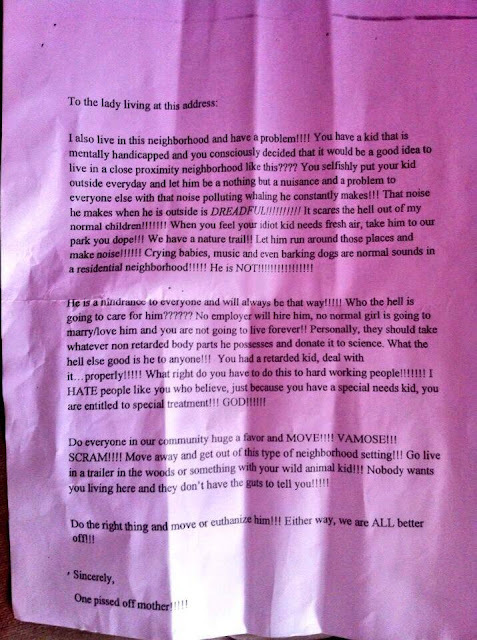 Hate letter sent to family of an autistic child: But the real disabled person is the sender! I read a story today that totally outraged my sense of human decency. A letter was sent to the family of an autistic child from an individual who identified herself as "one pissed off mother". The contents of the letter is nothing less than the ramblings of a vile mentality towards a child who has a disability. This letter was written about 13 year old Maxwell Begley. His Begley's received the letter on August 16th and contacted local law enforcement authorities immediately. When I read this letter and the story earlier today, I had to think about what my response would be if this type of letter arrived at the home where my autistic grandchild lives. I cannot imagine how it would feel for someone to send this type of letter and after all the things that they said would not be bold enough to sign their name. This is definitely the act of a true coward! Fortunately the people in the Oshawa, Ontario community have rallied in support of Max and his family. Police are current conducting an investigation to locate the sender of the letter. It is unfortunate that the sender did not take the time to even talk to Max's parents to gain some form of understanding about his autism and if there was some reasonable way to help her children not be afraid of the noises that he makes. Instead the sender opted to resolve the problem by proposing death to Max. I find this aspect of the letter to be truly distressing. Hopefully this woman will be found and if there are any charges that can be filed against her. You can read the entire story about the Begley family here.